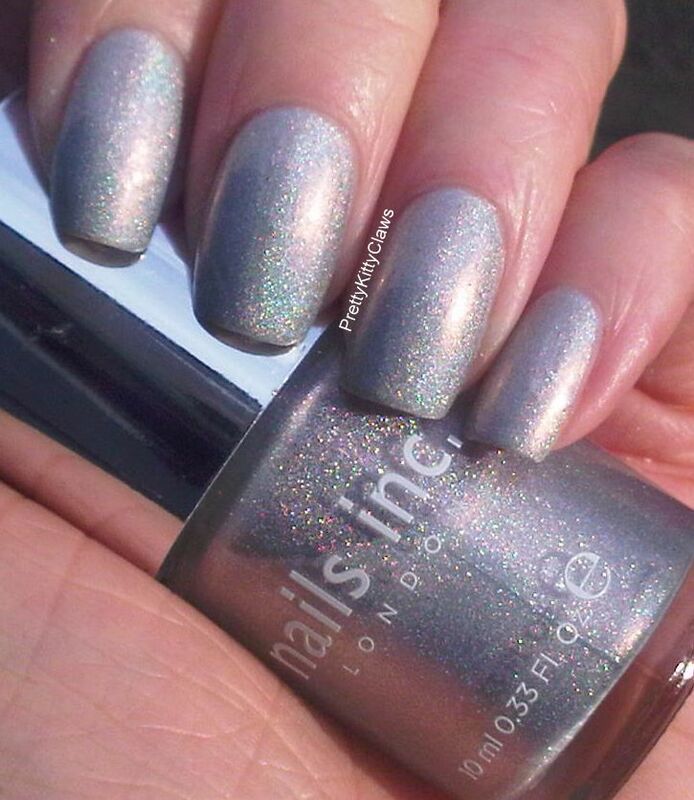 So today I have a new holographic silver polish from Nails Inc. I got this polish as part of a 7 piece kit on QVC, it was their Today's Special Value (special deal of the day) and each polish worked out to be about £4 which I thought was pretty good value. This one is called Royal Mews and I heard it will be released on it's own later in the year. Basically it's a pretty subtle silver holographic polish. This is 2 coats in some rare English winter sunlight. You can see some peach and pale green shining through. Application was smooth and dry time decent. It took 3 thin coats to acheive opacity but I didn't get any bald spots like sometimes happens with holographic polishes. I did top this one with a topcoat and it made no difference to the holographic quality. I think this is a nice introduction to holo's if you don't already have any, otherwise it's a nice work appropriate polish. I like my holo's a bit more in your face so after a day I topped mine with GOSH Holographic (which I will show you in another post). This made a good base and overall I think it's a nice addition to my stash. Ahh, thanks ladies. x I was really lucky to get a sneek peak of sun that day! I forgot to mention, this polish wore well too, I had it on for 3 days with minimal wear and a small chip on my thumb!